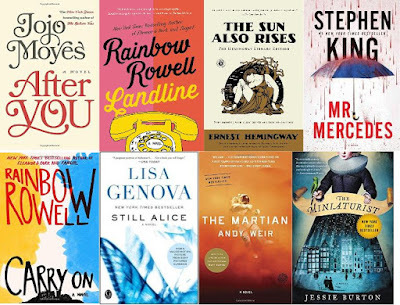 What I've Been Reading Catch-up: October- December | Oh Sarah O ! Although I've fallen a bit behind on updating what I've been reading, rest assured that I've still been reading. Today I thought I'd catch you up on some of the books I read from October through December 2015. Don't worry, a January post is coming soon! After You by Jojo Moyes Since my husband and I listened to Me Before You on Audible last year, we decided to listen to the sequel this year. The story picks up on Louisa Clark's life after the first book. Like most sequels, this book isn't quite as juicy as the first book, but it was still fun to re-visit old characters. The Sun Also Rises by Ernest Hemingway In September I travelled to Paris with my BFF, so I wanted to read a book about Paris life on the train. This book is about British and American ex-patriots in the 1920s who travel between Paris and Pamplona in pursuit of love, leisure and bull fighting. Landline by Rainbow Rowell I picked up this book because I was such a huge fan of Eleanor & Park, but this has got to be my least favorite Rainbow Rowell read to date. This story follows Georgie, a wife, mother, and T.V. writer who is at the end of her marriage, but finds a way to communicate with the husband she fell in love with years ago via the telephone. Mr. Mercedes by Stephen King I was looking for something a little spooky to read in October near Halloween, so of coarse I picked up a Stephen King book. This book is the first in a detective series trilogy about a serial killer and the retired cop who aims to catch him. This book had an air of familiarity to it as it referenced a real life serial killer from my home town. The story was gripping and I couldn't put this book down. Still Alice by Lisa Genova This book had been on my reading list ever since the film came out last year. I found this story to be fascinating, tragic and horrifying. Warning: you will probably think you and everyone around you has early on-set dementia when reading this book. The Martian by Andy Weir My husband and I had to listen to this book on Audiable before we watched the movie. Unfortunately, we took our time listening to the book and missed the theatrical release and had to wait to watch the film on video at home. I definitely think the book is better than the movie. The Miniaturist by Jessie Burton Unsure of what to read during my Winter Break from work, I borrowed this book from my husband's bookshelf. This book follows an 18 year old bride in 1600s Amsterdam whose distant new husband gives her a miniature cabnet of their home which changes her life. This book's story was slow initially, but once it got going it was full of all kinds of twists and turns. Carry On by Rainbow Rowell Do you love the Harry Potter series? Did you love Elenaor & Park? Then you will love this book! This was my favorite book at the end of 2015.